Actor Tom Cruise was snapped on the set of "Oblivion" sharing an on-screen kiss with co-star Olga Kurylenko in Mammoth, CA on Saturday. In Cruise's new film he plays Jack Harper, a veteran soldier who is sent to a distant planet to destroy the remains of an alien race. During his journey he meets Julia, played by the Ukrainian born "Magic City" star. 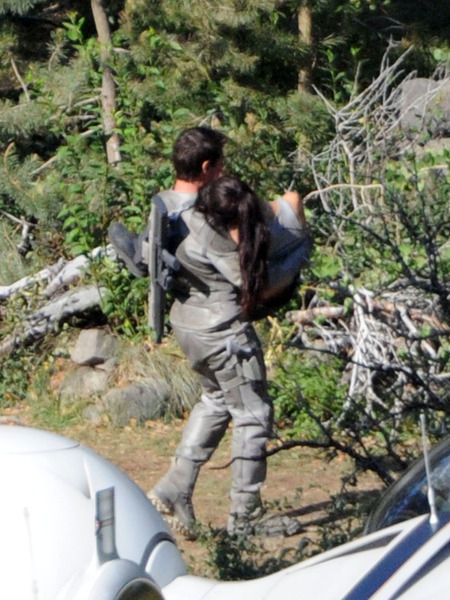 In the photo (credit: SplashNews) the "Mission Impossible" star is seen carrying his love interest away from a spaceship. "Oblivion" flies into theaters April 26, 2013.